We know your time is valuable and whilst we all enjoy a long lunch we understand that sometimes it is just not possible. At the RedBrick Hotel we offer a express pre-order lunch option in our restaurant, Monday to Friday (excluding public holidays). Our aim is to help customers that only have a short time for lunch get in and out with no fuss. To order please phone 07 3844 3236 or email the filled out order form to redbrick@hgroup.com.au before 11am on the day of dining. 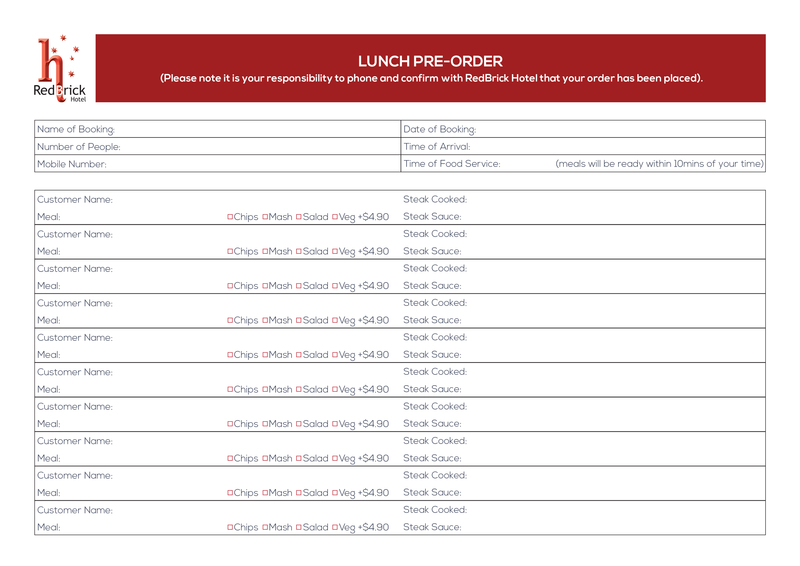 Please note it is your responsibility to phone and confirm with RedBrick Hotel that your order has been placed. We endeavor to get your food to the table within 10 minutes of your selected service time. Please ensure that everyone can arrive at this time to avoid food going cold. Please note that the menu has been designed to make it quick and easy for both the customer and the kitchen so we will be unable to swap items but we can remove items for you. Please let us know of any dietary requirements when ordering. Daily specials can be confirmed by phone on the day. When arriving at the hotel please make your way to the restaurant. You will be seated at your table and your bill will be presented to your table when you have finished your meals. We hope this helps speed up your valuable lunch time with us.